Many are asking if we have to sit around waiting for the current system to collapse. If we have only 3 years to turn around the emissions pattern as the UN has said, we had better get on with designing the next system. There will be only one currency for a country. The majority of the country’s money will be created and controlled by private banks. The money will be created as interest-bearing debt. All land, all natural resources and natural monopolies can be privately owned, and this means people can profit from buying and selling it. All major decisions will be made by national or international governments or agencies. This all adds up to a system with a growth imperative built in. (For years I thought it was just the money system but I believe now after a conversation with Steve Keen it is a combination of that and the land tenure system) The consequences are regular booms and busts, regular monetary crises, banking crises and sovereign debt crises and ever widening wealth inequality. The growth imperative also means that it is inevitable that we consume our natural and social capital. Perpetual growth is not natural. There is no entity in nature which is designed to grow forever, unless, as Margrit Kennedy pointed out, you count cancer. And now we are paying for our blindness with floods, droughts, coastal erosion and food shortages. Therefore the phrases ‘doughnut economy’, ‘stable state economy’, ‘no-growth economy’, ‘regenerative or resilient economy’ are good descriptive words, but they don’t change the current economy’s DNA. We have been inventing more and more names for this since the publication of The Limits to Growth and arrival of the NZ Values Party in the seventies. They all sound good but we can’t go on and on pretending there isn’t a growth imperative built into the design of our mono-currency economy. It is like saying I would like this rose to be white and scented but in fact it is red and unscented. The redness and unscented is built into its DNA and no amount of nice new language or great new writing will alter it. We just can’t go on creating more and more names for a good economy. I am sure economists like Kate Raworth are contributing to raising awareness but honestly, give or take a few years of dormancy, people in the advanced economies have been at it since the 1970s. The Greens talked about it for a few years but dropped it like a hot cake quite a while ago. Now I don’t expect too much new thinking will come out of universities. It is tricky for a university economist to breach the parameters of what they can say without losing their salary. Professor Steve Keen is having to crowdfund his salary now. It must be publicly created and controlled for inflation. The currency will be spent into existence not lent into existence. The commons must be publicly owned and rent for their monopoly use must replace income tax and sales tax. I realise that these are all huge jumps in thinking and the last point means there have to be very strong leasehold contracts to protect the occupier of the property together with no rent on land used for conservation or historic purposes. Naomi Klein has spelt out this challenge for a new economic system in her book This Changes Everything. Though The Next System Project is grappling with the challenge of finding it in Washington DC it would be great to have a special platform somewhere in NZ to work on it ourselves. 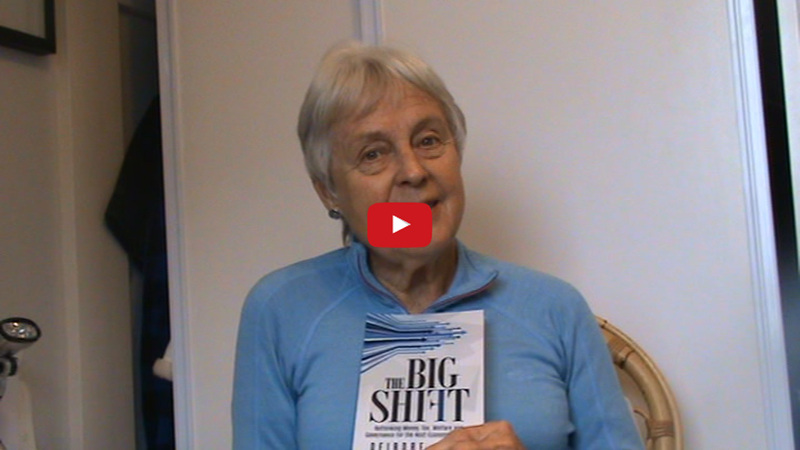 Oh, and by the way, my book The Big Shift – Reinventing Money, Tax, Welfare and Governance for the Next Economic System is available from Living Economies bookshop. It is the result of a four-year think tank of what was the New Economics Party and is the source of the above ideas. We may be right we don’t know, but we tried. 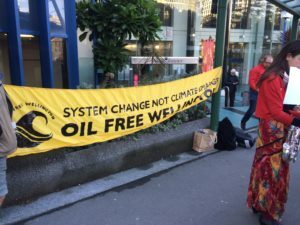 On approaching the High Court yesterday I was first struck by the sign outside that said “System Change not Climate Change” held up by a pressure group. Why didn’t I call my book this? It’s a damn good slogan. 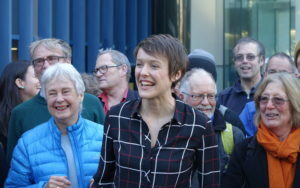 Crowds soon gathered and the media arrived to interview Sarah Thomson, the law student taking the case on climate targets. When a 24 year old takes the Government to court it has got to be newsworthy and important. 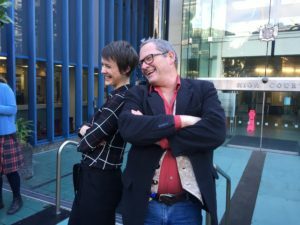 When her lawyer Davie Salmon started up, the years of preparation showed and a very long friendly conversation between Salmon and the judge began. 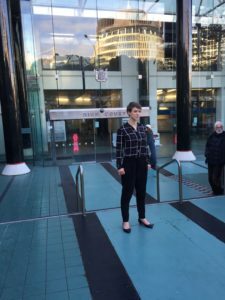 Huge piles of documents were behind the young woman judge and I couldn’t help thinking this judge has the power to rule that the government revisit its emission targets and she looks five foot nothing. We have to stand up when she leaves the court. The argument that New Zealand is small therefore we don’t need to do much was thoroughly demolished, especially with Salmon’s suggestion that if the boat is sinking everybody bails, no matter how small their bucket. He took us through the difference between the target of 1.5 degrees vs 2 degrees of warming. Reality strikes when you realise that, although he said he wouldn’t exaggerate, he used the word ‘catastrophic’. Yes beyond two degrees it is catastrophic and James Renwick had reminded us outside that it is only five years till we get to 1.5 degrees. David Salmon persuasively argued that you shouldn’t rely on technologies that don’t exist yet to take carbon dioxide from the atmosphere. He said it was like telling someone to keep smoking in the hope someone would invent a cure for lung cancer. One cannot predict inventions. Therefore no real weight can be put on that hope. Sarah and her boyfriend were sitting in front of me in the gallery. Occasionally she would lay her head on his shoulder. When later she put her arm around him I wondered if that couple would ever have children and what sort of world will it be for them. Will their mothers grieve for the grandchildren they wish they had? But I do know they should be immensely proud of their children and of themselves for bringing them up to have such a huge sense of responsibility. My thoughts, as always, went to economics. Where were the economists in this court? I couldn’t see a soul. What would they say if they were here? 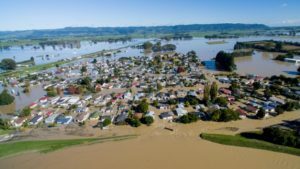 Yes, Salmon talked about Business-as-Usual scenario and I thought that even Helen Clark’s government did nothing to stop the intensification of dairy because it feared the economy wouldn’t grow enough and they would be out of government. And so we get agricultural emissions rising. And Naomi Klein realised the economy was at war with the climate. So I thought what would it really take to change the economic system from growth dependent to a healthy one? How many really want to face up to the money system and that the land tenure system (and therefore the tax system) simply have to change. It’s a big shift for people’s mindsets. What causes the growth imperative? It is the combination of privately owned land system with an interest-bearing debt money system controlled by private banks. A match made in hell. Maybe we have to get to hell before we wake up. 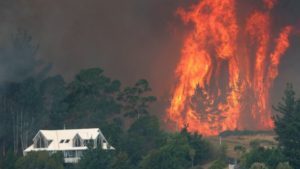 We have the choice of catastrophic climate change or economic collapse. Both are horrible. Please, someone, focus on changing the political economy before it is too damn late!! I kicked myself that I hadn’t written a flyer for my book and taken it with me.